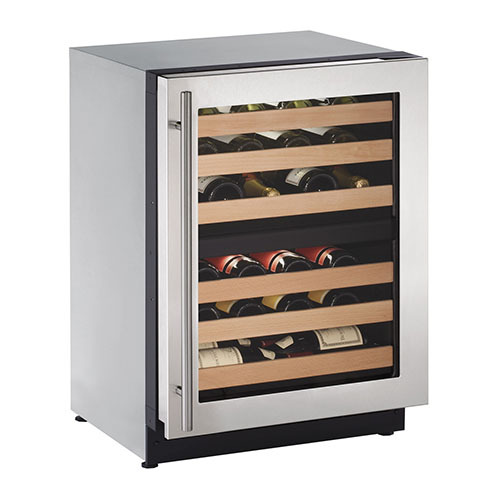 Put your beloved wine collection on stunning display with the U-LINE 15 Wine Captain 48 Bottle Stainless Steel Wine Cooler (1024WCS-00A) installed in your home. You can store up to 48 bottles of wine in this cooler on its zinc-coated racks that smoothly glide. It's sure to maintain temperatures between 40 degree and 60 degreeF with its passive cooling system and LowE-coated, argon gas-filled thermopane glass door. This cooler can be used in a variety of settings thanks to its built-in or freestanding installation and reversible door swing. It has a professional look with an attractive stainless steel finish and attractive beech wood fronts on the racks.Reliable: This wine cooler can hold up to 48 bottles of wine between 40 degree and 60 degreeF on zinc-coated racks with beech wood fronts.Versatile: It's designed for built-in or freestanding installation and a reversible door swing.Easy: This wine cooler features convenient mechanical dial controls. 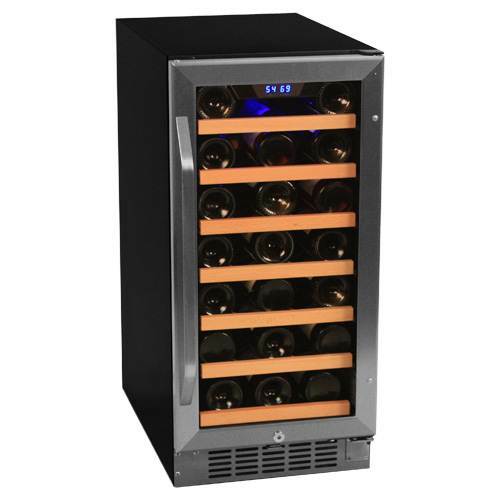 Let your wine collection thrive with the U-LINE 24 Wine Captain 48 Bottle Black Wine Cooler (1224WCB-00A) and its reliable operation. You can store up to 48 bottles of wine in this cooler on its zinc-coated racks that smoothly glide. It's sure to maintain temperatures between 38 degree and 65 degreeF with its passive cooling system and LowE-coated, argon gas-filled thermopane glass door. This cooler can be used in a variety of settings thanks to its built-in or freestanding installation and reversible door swing. 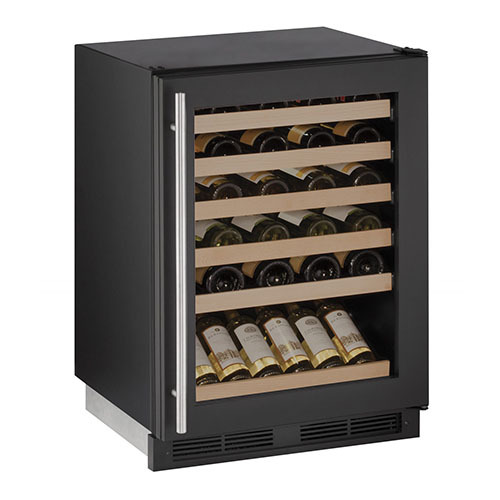 It has a professional look with an attractive black finish and beech wood fronts on the racks.Reliable: This wine cooler can hold up to 48 bottles of wine between 38 degree and 65 degreeF on zinc-coated racks with beech wood fronts.Versatile: It's designed for built-in or freestanding installation and a reversible door swing.Easy: This wine cooler features convenient digital touchpad controls. Your wine collection will thrive in the U-LINE 24 Wine Captain 48 Bottle Stainless Steel Wine Cooler (1224WCS-00A). Store up to 48 bottles of wine on zinc-coated racks. The racks accommodate a variety of bottle shapes and sizes and the fourth and fifth racks provide space for larger bottles, like champagne. This wine cooler features a digital cooling system that offers a temperatures range from 38 degree to 65 degreeF. It has a passive cooling system, relative humidity level of 50%, and LowE-coated, argon gas-filled Thermopane glass door that helps regulate conditions inside. It has a professional look with a stainless steel finish and handsome solid natural beech wood fronts on the wine racks.Wine Capacity: This 5.2 cubic foot wine cooler holds up to 48 bottles of wine on 6 zinc-coated racks that operate smoothly for easy access. Racks accommodate a variety of bottle sizes and shapes, plus 2 racks provide room for larger champagne-style bottles.Constant Temperature: To maintain temperature, this wine cooler has a Thermopane glass door that is LowE-coated and argon gas-filled.Eye-Catching Style: It has a sleek look with a black interior cabinet, stainless steel door, and natural beech wood slats on the wine racks. Designed to accommodate your varied wine collection, the U-LINE 24 Wine Captain 43 Bottle Stainless Steel Wine Dual Zone Wine Cooler- Right Hinge (2224ZWCS-00A) offers versatile storage and high style. You can enjoy both reds and whites in their ideal condition thanks its pair of independently-controlled, digital passive cooling zones. This dual zoned wine cooler maintains temperatures between 38 degree and 65 degreeF with its innovative convection cooling system and LowE-coated, argon gas-filled Thermopane glass door. Plus the six zinc-coated wine racks accommodate a variety of bottle sizes, including the third and sixth racks that offer room for larger, champagne-style bottles. This cooler features a handsome stainless steel design with black interior and natural beech wood rack fronts. Dual Cooling: This 4.7 cubic foot cooler holds up to 43 bottles of wine with dual, independent cooling zones perfect for both red and white wines.Sabbath-Friendly: With a Star K certification, this cooler is made for use on Jewish Sabbath and holidays.Thermopane Door: The glass door is LowE coated and filled with argon gas to protect from UV damage and maintain temperature. 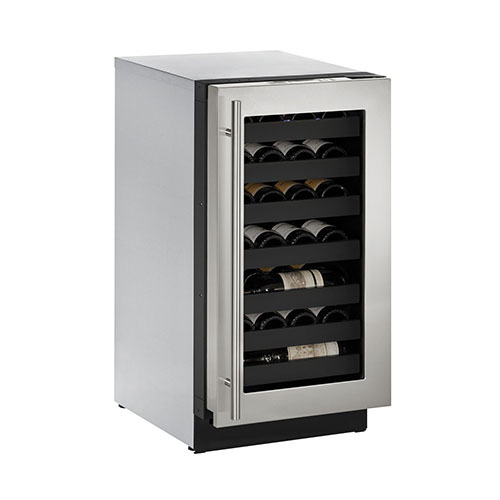 Store your wine collection in peak form with the U-LINE 18 Wine Captain 31 Bottle Stainless Steel Wine Cooler (3018WCS-00A). This cooler features an innovative U-Select Control with digital OLED display that is ergonomically located on top of the door. U-Select Control offers three distinct modes: Sparkling Wine: 38 degreeF - 50 degreeF, White Wine: 45 degreeF - 55 degreeF, Red Wine: 55 degreeF - 65 degreeF. Scaled small on the outside, but generous inside, this cooler features seven zinc-coated racks that allow you to store up to 31 wine bottles in varies sizes and shapes. Store larger diameter bottles on the fourth and fifth racks. This wine cooler's convection cooling system and LowE-coated, argon gas-filled Thermopane glass door maintain temperature with ease.Maximum Wine Storage: Seven zinc-coated wire racks operate smoothly and offer space for 31 wine bottles of various sizes and shapes, including champagne bottles on the fourth and fifth racks. U-Select Innovative Cooling: U-Select controls let you choose between three distinct modes for sparkling, white, and red wines.Thermopane Door: The LowE-coated and argon gas-filled door protects from UV damage and maintains your ideal temperature.Sabbath-Friendly: Star K certified, this wine cooler is designed to adhere to Jewish Sabbath and holiday observance. 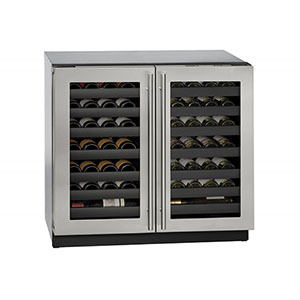 The U-LINE 18 Wine Captain 31 Bottle Stainless Steel Wine Cooler with Lock (3018WCS-13A) protects and stores your wine collection at the perfect temperature, storage angle, and in high style. This wine cooler has an innovative U-Select Control with digital OLED display that is conveniently located at the top of the door. U-Select Control offers three distinct modes: Sparkling Wine: 38 degreeF - 50 degreeF, White Wine: 45 degreeF - 55 degreeF, and Red Wine: 55 degreeF - 65 degreeF. Its smaller scale and handsome stainless steel design make it a natural addition to your contemporary kitchen or wine room. 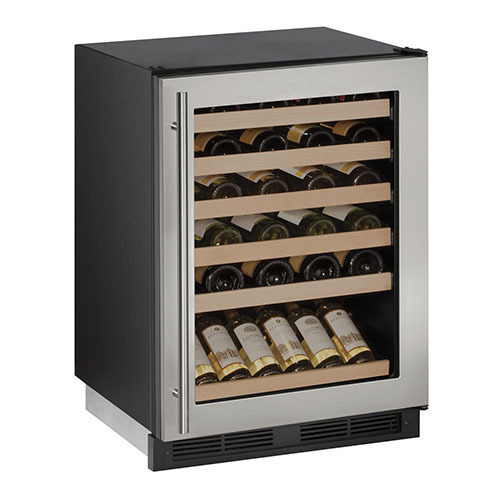 This wine cooler features a digital convection cooling system and LowE-coated, argon gas-filled Thermopane glass door that maintain the perfect temperature with ease. This door locks to protect your investment. Open the door to find zinc-coated racks that offer storage for up to 31 wine bottles. Versatile Wine Storage: Seven zinc-coated wire racks operate smoothly and offer space for 31 wine bottles of various sizes and shapes, including champagne bottles on the fourth and fifth racks. U-Select Innovative Cooling: U-Select controls let you choose between three distinct modes for sparkling, white, and red wines.Locking Thermopane Door: The locking LowE-coated and argon gas-filled door protects from UV damage and maintains your ideal temperature.Sabbath-Friendly: Star K certified, this wine cooler is designed to adhere to Jewish Sabbath and holiday observance. Keep both reds and whites perfectly stored with the U-LINE 24 Wine Captain 43 Bottle Stainless Steel Dual Zone Wine Cooler (3024ZWCS-00A). 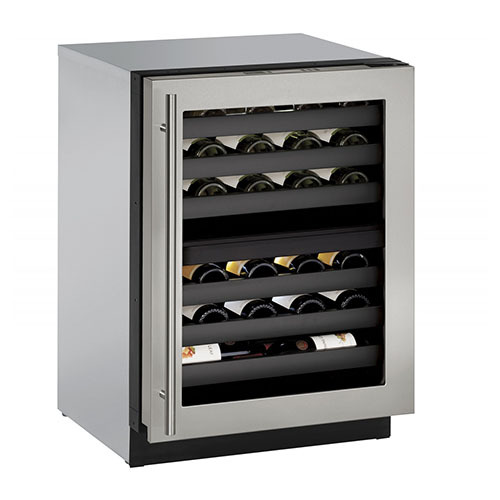 Designed to accommodate your diverse wine collection, this cooler offers two independently controlled temperature zones. Each zone features an innovative U-Select Control with digital OLED display located at the top of the door. U-Select Control offers four distinct modes: Beverage: 34 degreeF - 65 degreeF, Sparkling Wine: 38 degreeF - 50 degreeF, White Wine: 45 degreeF - 55 degreeF, and Red Wine: 55 degreeF - 65 degreeF. The LowE-coated, argon gas-filled Thermopane glass door helps maintain temperature. Store up to 43 bottles of wine on the 6 easy-glide racks. Engineered to accommodate a variety of bottle shapes and sizes, this cooler includes two racks (the third and sixth) that offer extra room for larger diameter bottles, like sparkling white wines. U-Select : Innovative Cooling:U-Select controls let you choose between four distinct modes: beverage, white wine, red wine, and sparkling wine.Dual Zone: This wine cooler can hold up to 43 bottles of wine in 2 independently controlled cooling zones. Each zone has three racks for a total of six.Sabbath-Friendly: For those observant of Jewish Sabbath and holidays, this cooler is Star K certified. Store and protect your versatile wine collection in high style with the U-LINE 24 Wine Captain 43 Bottle Stainless Steel Dual Zone Wine Cooler with Lock (3024ZWCS-13A). This cooler is designed to accommodate your diverse wine collection. It has two independently controlled temperature zones, each with an innovative U-Select Control with digital OLED display located at the top of the door. U-Select Control offers four distinct modes: Beverage: 34 degreeF - 65 degreeF, Sparkling Wine: 38 degreeF - 50 degreeF, White Wine: 45 degreeF - 55 degreeF, and Red Wine: 55 degreeF - 65 degreeF. The LowE-coated, argon gas-filled Thermopane glass door helps maintain temperature and locks to protect your wine investment. Six easy-glide racks make it easy to store up to 43 bottles of wine. Engineered to accommodate a variety of bottle shapes and sizes, this cooler includes two racks (the third and sixth) with ample room to store larger diameter bottles like champagne. U-Select : Innovative Cooling:U-Select controls let you choose between four distinct modes: beverage, white wine, red wine, and sparkling wine.Dual Zone: This wine cooler can hold up to 43 bottles of wine in 2 independently controlled cooling zones. Each zone has three racks for a total of six.Locking Thermopane Door: The locking LowE-coated and argon gas-filled door protects from UV damage and maintains your ideal temperature.Sabbath-Friendly: For those observant of Jewish Sabbath and holidays, this cooler is Star K certified. Designed to complete your home theater or bar in style, the U-LINE 36 Stainless Steel Wine and Beverage Center (3036BVWCS-00A) is perfect for the whole family. Kids have plenty of room for either 79 bottles or 123 cans of sodas on one side and on the other side resides 31 standard wine bottles. It also can accommodate a variety of bottle sizes and shapes. Each side features an independent cooling zone. These convection cooling systems, combined with the two LowE-coated, argon gas-filled glass doors, hold temperatures within 1 degreeF of the set point. Each door has a U-Select Control with digital OLED display located on top of the door. U-Select Control offers five distinct modes on the right: Beverage: 34 degreeF - 40 degreeF, Deli: 34 degreeF - 40 degreeF, Market: 34 degreeF - 40 degreeF, Pantry: 34 degreeF - 70 degreeF, and Root Cellar: 45 degreeF - 55 degreeF. While the left cooling area offers four modes: Beverage: 34 degreeF - 65 degreeF, Sparkling Wine: 38 degreeF - 50 degreeF, White Wine: 45 degreeF - 55 degreeF, Red Wine: 55 degreeF - 65 degreeFU-Select Control: Simple U-Select controls let you choose between five distinct modes in the right cooling area and four distinct modes on the left .Even Temperature: LowE-coated and filled with argon gas, the Thermopane glass door maintains temperature within 1 degreeF.Sabbath Ready: Certified with a Star K rating, this cooler offers a mode to observe Jewish Sabbath and holidays. The U-LINE 36 Wine Captain 62 Bottle Stainless Steel Double Door Wine Cooler (3036WCWCS-00A) lets you store your extensive and varied wine collection all in one stylish place. 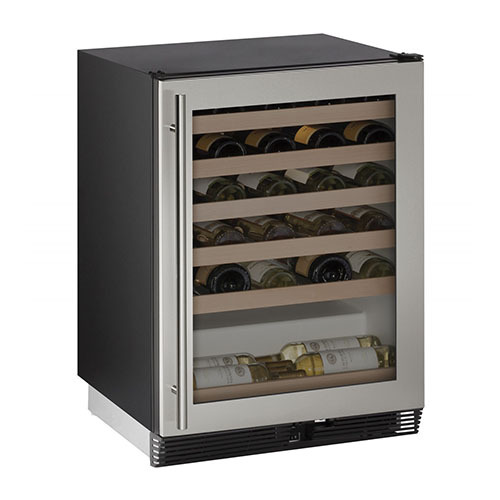 This generous wine cooler features French style doors that open to allow you access to your 62 bottles of wine. Two independently-controlled cooling zones make it ideal for red on one side and white on the other. Each side features a U-Select Control with digital OLED display located on top of the door. U-Select Control offers three distinct modes: Sparkling Wine: 38 degreeF - 50 degreeF, White Wine: 45 degreeF - 55 degreeF, and Red Wine: 55 degreeF - 65 degreeF. Its digital convection cooling systems and twin LowE-coated, argon gas-filled Thermopane glass doors maintain temperatures to within 1 degreeF of the set point to maximize preservation. U-Select Control: Each side features an innovative U-Select control that lets you choose your preferred cooling mode: red, white, or sparkling wines.Consistent Temperature: A Thermopane, LowE-coated and argon gas-filled door protects deflects harmful UV light while maintaining ideal temperature.Ample Storage Space: This 7.0 cubic foot wine cooler has 14 racks and can hold up to 62 wine bottles of various sizes and shapes. The third and sixth rack on each side accommodate larger diameter bottles.Sabbath Observant: This cooler has a Star K certification for observant use during Jewish Sabbath and holidays.